Breakfast is not my favorite meal of the day. I don’t wake up hungry and it takes me a few hours of being awake and busy before the thought of food even sounds appealing. I understand though that breakfast is the most important meal of the day. In fact, it can make or break your food choices for the rest of the day if you’re not careful. Therefore, I lean towards something light, easy, and nutritious. Monday through Friday, this is a picture of my typical go-to breakfast choices. 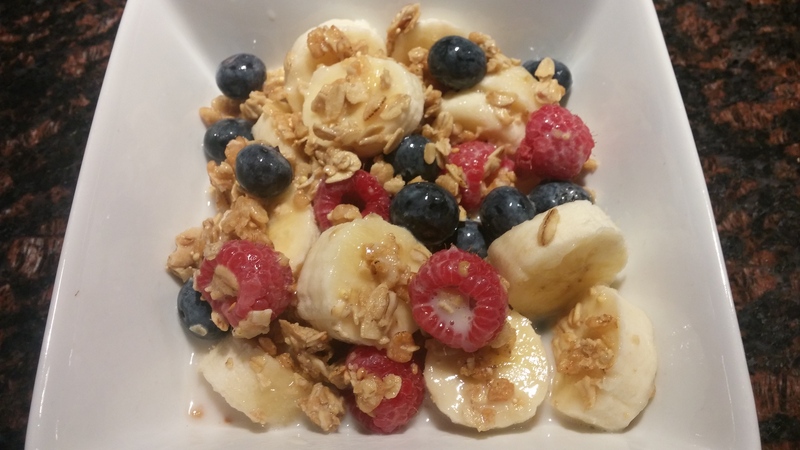 berries and bananas with granola and splash of almond milk. Sometimes the occasionally avocado toast gets thrown in there too but this is why you don’t see me posting breakfast pics on Instagram (pretty boring huh?). This is also why when the weekend rolls around, I’m ready to up my breakfast game. As a kid, Saturday and Sunday were a welcomed relief from the Cheerios box with a hearty cooked meal from my momma. This usually consisted of either fluffy biscuits and gravy, buttery pancakes, perfectly scrambled eggs and bacon, or syrupy waffles; typical Texas breakfast foods. Like my momma, I enjoy and look forward to the leisurely weekend mornings where I can make a hearty and savory (albeit vegan) breakfast. 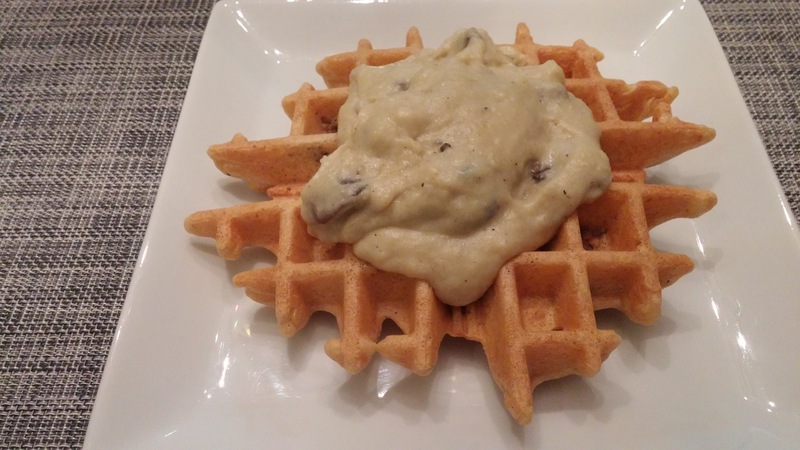 For instance, these wacked-out waffles with mushroom gravy I made a few weeks back. I took my basic cornmeal waffle recipe and took it up a notch by adding some leftover tempeh bacon. Then I made my basic gravy recipe (http://katmendenhall.com/recipe/texas-gravy-like-no-other/ ) but added some saute mushrooms. Basically I took some baby bella mushrooms, cleaned and sliced them, put them in pan with a bit of hot olive oil, and sauted them until softened. I then set them aside while I made the gravy and added them back into the gravy mixture as it was thickening. Did I mention I like savory? Try adding a dash or two or three of hot sauce too to kick the spice level up. Everything was super easy to make and definitely worth the extra time. I even enjoyed the left-overs a few days out (for those ideas check out my suggestions in the recipe below). I hope you get to spend some extra time in the kitchen this weekend, trying out this recipe, or concocting your own wacked-out breakfast. These savory waffles are not for mornings alone. Give them a try for lunch or dinner by topping them with some grilled tofu, cooked spicy beans or some hearty sautéd mushrooms. 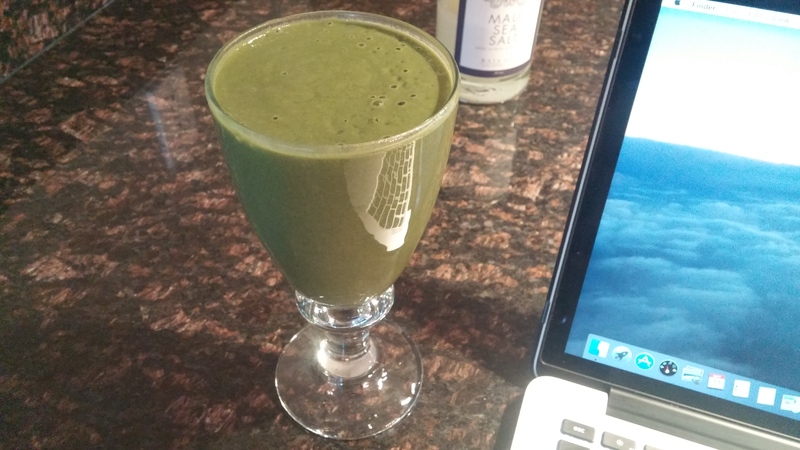 Don't forget your greens! Heat up a waffle iron. Mix together the soy milk and vinegar in a small bowl and set aside. In a large bowl, wisk together the cornmeal, both flours, brown sugar, baking powder, salt and cinnamon until combined. Make a dent in the middle of the dry mixture and add the milk/vinegar mixture and the oil, continue to wisk until all the ingredients are thoroughly blended. Gently fold in your cooked pieces of tempeh so that they are evenly distributed in the batter. Open the pre-heated waffle iron and spray it with the coconut oil, then pour in about a 1/2 cup (depending on the size of waffle iron) of batter. Cook each waffle 3-4 minutes or until golden brown. Top each waffle with a couple of healthy spoonfuls of mushroom gravy.